Being the last day of March and given that the conditions were pretty good I thought I would give the Meander River a go today after lunch. The weather was a little on the humid side with a light East to North Easterly breeze and very heavy cloud cover making it reasonably good for trout fishing. The only down fall was the wind direction, but in saying that it was very light and so it hopefully won't effect the fishing that much. With the forecast being for fine and mild conditions I thought it worth while to head over to the Meander River this morning for a few hours. I wasn't happy with the wind direction that came with the forecast though, South East to Easterly winds. I don't normally do too well with the wind from any easterly direction but I still thought it would be nice to have a session in the Meander any way. With a Nth Easterly wind this morning I wasn't even thinking of going fishing today until around 1.00pm when it died off. It was cloudy and now even a little humid and so it was on with the fishing clothes and off to the Meander River. Once there the sun had broken through, but there was also a reasonable amount of cloud around as well still making it pretty good for a spin session. The river was medium to low in height and running clear making me stick with the small Mepps black bladed Black Fury. Thought I would head off to the Meander River and a nearby creek this morning to see how high they were running in the hope of may be having a wade for a change. 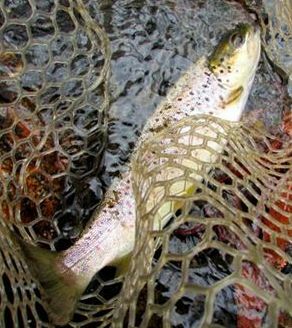 I have enjoyed several stints of bait fishing, but deep down now where near as good as being in a river chasing trout. Another 3 hours were spent on the Meander River this afternoon fishing in sunshine and a north easterly for most of it, not my favourite type of condition to fish in. Still there were several areas that had shade on it thanks to the many Eucalypts along the river and this was where the fish were holding. The river seemed a little higher today which was a good sign, because the last trip here it was way too low. Hydro must be releasing more water for irrigation purposes and I was hoping this may give the river a much needed lift for fishing. I fished on of the toughest stretches of the Meander River this afternoon from 2.45pm to 6.15pm in mainly overcast conditions and low, clear water. This stretch of river that I fished is around 1.5 kms in length and always gives up a few fish, but it's tough going and you earn every fish that one catches. It's full of every size rock and boulder that can trip you up at any time if your mind's not on the job. Take time and make sure you have good footing under you before taking the next step forward. It varies from water depth below the knees to waist deep in many sections in fast and slow sections of it and one slip and could be a few bruises or a wet backside. This stretch of river has many fast water areas along it which I love to fish especially at this time of year and it does give up some nice medium browns that usually average around 360 gms. Cloud cover this afternoon made for me to head off to the Meander River for a session of spinning the fast water once more. Arrived around 3.15 PM and once again as soon as I put my waders on, Bingo! Out came the sun again. Not deterred I still hit the river full of confidence and it wasn't too long before I had my first fish on the line and it was a small solid brown of some 240 gms. I headed off to the Meander River this afternoon for a few hours spin fishing given it was nice and overcast in Sheffield and quite mild. When I arrived at the Meander the clouds started to separate and then the sun broke through and boy it had a bit of bite in it too. I already knew where I was going to fish and it was the fast water sections of the river. Still had the old Mepps Black Aglia on that I have stuck with over many trips now and it worked once again as it was fish on in the third cast into the river. 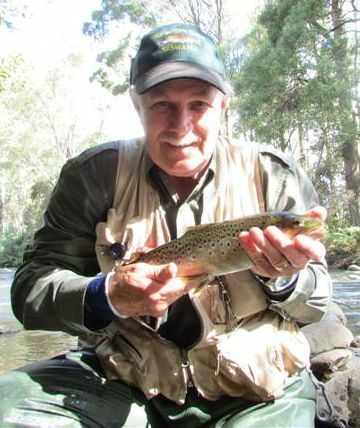 We fished the Meander River on Sunday with mate Shippy. We arrived at the river about 9am, got in the water and waded up the river about a kilometre. One on each side of the bank using nymphs. Not much happened for a little way then Shippy was on but he dropped him. We moved up, next he was on to a small fish, put him back. I finally a day with hardly a breath of wind and also a little cloud cover instead of the bright clear skies, gale force winds and heat. Today I headed of to the Meander River some 50 kms from Sheffield and was on the river for my first cast for 2013 at 7.30 am. 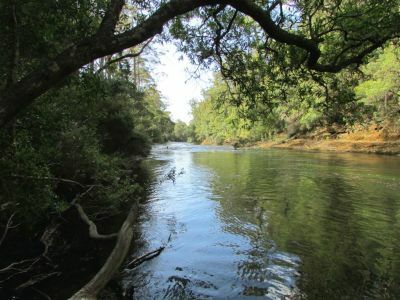 The river was low and clear with a good steady flow and plenty of fast water sections plus a bonus, the rocky bottom did not have one bit of slime on it. This makes it much easier for wading even though it's still tough going due to the boulder strewn river.